The diet industry in Britain is a multi-billion pound industry. The problem with both dieting and exercise programmes is that, on their own, they do not work with the underlying reasons why people constantly lose weight only to regain it and end up with a larger body mass index than at the start. At any one time, it is estimated that over two thirds of British women in total are on a slimming regime. Scientific research shows that patterns of comfort eating of high carbohydrate and fat rich foods begin in childhood where stress and emotional pain and their concomitant reduction of these chemicals in the brain (cortisol, serotonin uptake, endorphin or natural morphine response in the brain, noradrenal) are greatly reduced after eating high calorie, high fat foods. Childhood behaviour patterns to reduce stress and emotional pain are carried through into adulthood, and are reinforced because they are effective in the short term in reducing the symptoms associated with low mood. This is one of the reasons many people over-eat. In a society which over-emphasises slimness as the way to success, love and personal happiness, even in childhood, the relationship between self worth and a positive self image are strongly correlated with body image, and problems begin with the internalisation of these values with their relationship and meaning of food in itself. 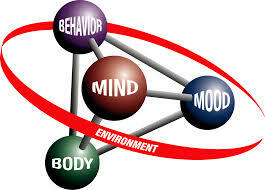 CBT is more effective than diet and exercise regimes on their own because it works at the underlying core issues which perpetuate these gain loss cycles. By treating the underlying causes of these patterns clients are understandably less prone to relapse. problems of self worth, self esteem. a self image which has a distorted picture of how one physically appears to others. difficulty in providing alternative strategies for coping with anxiety and depression. Specific problems socially related to self-consciousness in social situations. Relationship issues with men/women in the physical/sexual presentation of the self. Unresolved Childhood Trauma - Childhood problems which have been unresolved and make maturation into adulthood more difficult. These are just a few of the underlying problems which cause people to overeat. WLC can address all your emotional issues and break down your personal barriers to Weight Loss.